Thanks to all who signed our petition! The petition is now closed, but you can still view the on-line signatures. 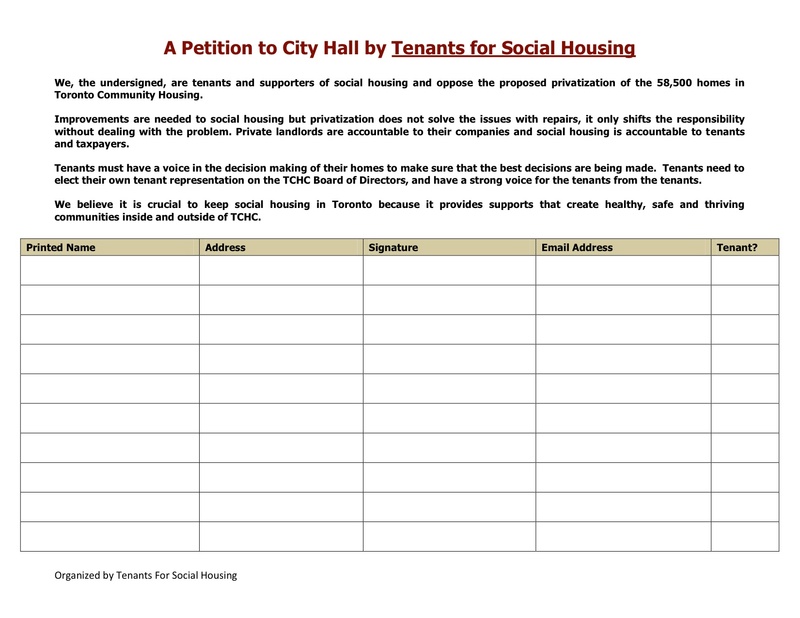 Selling the TCHC houses would displace tenants, both RGI and market-rent. Market-rent tenants would be required to leave to make room for RGI tenants and thus mixed-income housing, which is vital for healthy communities, would come to an end. Toronto would be back in medieval times with ghettoes for the poor. Let’s not go backwards. As a resident and homeowner on Beverley Street since 1977 ,I have had the priviledge of living among people of all walks of life . These people come from the corporate world, the artistic community , academics , subsidised groups etc… Grown ups and children living in the subsidised Beverley St. Toronto housing own and respect the well being of their environment and the city needs to understand and reflect upon the benefits and values of healthy mixed communities before making irreversible $ decisions. Thanks for this comment Beatrice! We appreciate your support. Selling THC housing is very short-sighted by every measure. Would you sell your basement in order to do repairs on the main floor? What happens when you need repairs to the second floor? Sell the main floor? That’s crazy economics in my view. As for the social aspects, I regard it as equally flawed. Mixed communities–mixed in every way, including economic–are the key to a healthy environment and a strong society. But if we want to set class against class and foment social unrest, then selling THC housing stock is a good way to start…. Thanks for your thoughts Marion! We agree that selling social housing is an attack on the poor. Let’s go forward not backwards!! !